Hidden trophies take away the fun of good old gaming. They force you to have to look them up here on the internet because some are just impossible to figure out on your own. They are ridiculous. Some games have hidden trophies that you wont be able to unlock no matter how many times you play the game. How in the world are you ever supposed to guess what they are?! 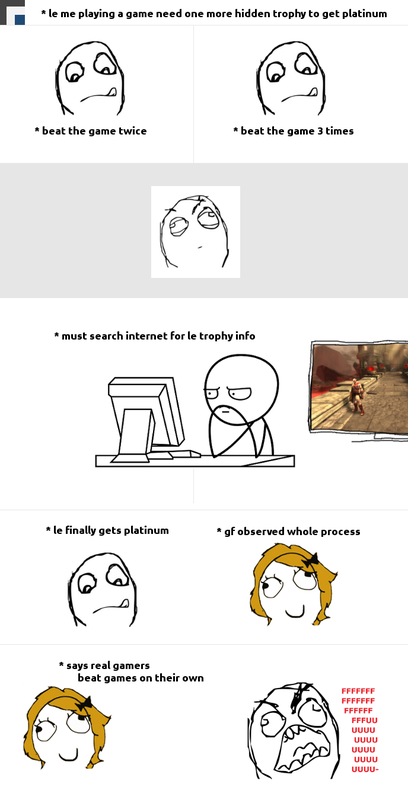 We usually end up searching up a trophy guide because we just don't want to waste our time. It really is annoying. I pride myself in completing games that I like. It's a real shame when I can't for the love of gaming, figure out what that hidden trophy wants me to do! I have to look it up and then I feel cheated. Robbed of my true self completion. There is really only one reason to have hidden trophies and that is to save us from the spoilers of plot points and such. Has anyone out there ever had similar troubles with hidden trophies? Or is this just me over here?